As previously reported, French robots Daft Punk will grace the stage of the 56th Grammy Awards on January 26, offering up their first live performance since releasing Random Access Memories last year. Now, more details have emerged. Rather than just pop up in their shiny masks, the duo will bring a hefty crew of collaborators on board. Sources confirmed to Pitchfork that the group will perform with Stevie Wonder, Pharrell, Nile Rodgers and the Random Access Memories session performers. 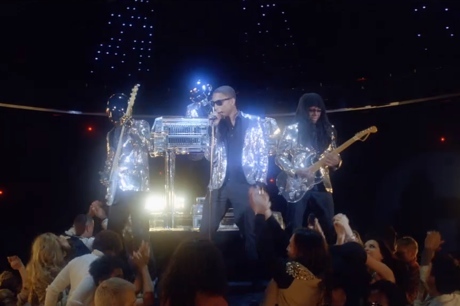 In addition, Daft Punk's Random Access Memories could take home up to five Grammy Awards, including Album of the Year, Record of the Year and Best Engineered Album, Non-Classical, plus nominations for Best Pop Duo/Group Performance and Record of the Year for "Get Lucky." We have a feeling they won't be going home empty-handed. The Grammy Awards will air on CBS and will also include performances from Kendrick Lamar, among others. Read more about the nominees here.